For this project, our goal was to investigate how positive and negative charges play a role in the interaction of gold nanoparticles with model cell membranes. How would positively and/or negatively charged particles interact with a negatively charged model membrane system? (Would they interact at all?) This may seem like a simple question to answer, but it turns out that sometimes in chemistry “opposites attract” doesn’t give us the whole picture. As a member of the Geiger group at Northwestern, my research focuses on using laser techniques called nonlinear optics, which we discussed in an earlier post. Before we started studying how the gold nanoparticles interacted with our model membrane system, we used a laser technique called second harmonic generation to determine that the model, a lipid bilayer, is negatively charged. Given that, we expected that positively charged nanoparticles would interact with the bilayer and negatively charged particles would not. However, using second harmonic generation again, we observed that both the negatively charged particles and the positively charged particles attached to the negatively charged lipid bilayer. Given how new our laser methods are and in order to make sense of this unexpected finding, we needed to confirm our observations with an independent method. This is where our collaborative effort with other labs in the CSN became extremely important. To confirm the presence of the negatively charged particles we turned to our collaborators at Madison from the Pedersen and Hamers groups. They use quartz crystal microbalance with dissipation (QCM-D) to measure the mass of nanoparticles attached to a bilayer, and x-ray photoelectron spectroscopy (XPS) to detect gold (from the nanoparticles) at the bilayer surface. Unfortunately, in this case these techniques were not sensitive enough to confirm the presence of the negatively charged nanoparticles on the bilayer, meaning we would need even more sensitive techniques to tackle this problem. This information did however help us pinpoint a maximum number of particles on the surface given the limit of detection for these experiments. Our collaborators at Madison also tried a third technique called atomic force microscopy to study this system, and this experiment revealed features that could be the gold nanoparticles on the bilayer, but it couldn’t give us concrete evidence that the features it showed were actually gold nanoparticles. At this point I was feeling a bit discouraged because I had run out of ideas, but when you are working with a fantastic group of interdisciplinary scientists someone always has something more to contribute. With the help of our collaborators at the Pacific Northwest National Laboratory we analyzed the system using a technique called time-of-flight secondary ion mass spectrometry. 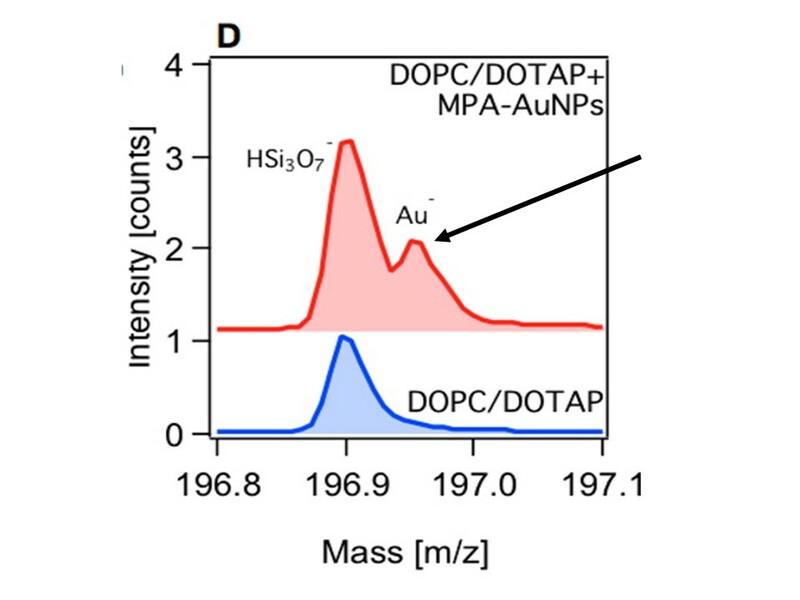 Finally, we were able to confirm the presence of negatively charged gold nanoparticles on the negatively charged lipid bilayer! This work is important because we want to be able to predict how a nanoparticle will behave in the environment and here we learned that simple laws of electrostatics aren’t enough to model the interaction of charged nanoparticles within a system. Even though opposite charges attract in macro-scale interactions, it turns out nanoparticle-membrane interactions are more complicated. In other parts of this study we explored the structure of the lipids with and without particles present, examined the mass of particles attached to the bilayers, and calculated the charge associated with particles attached to the bilayer. But that’s a story for another post! 1. Troiano, J.; Olenick, L.; Kuech, T.; Melby, E.; Hu, D.; Lohse,S. ; Mensch, A.; Dogangun, M.; Vartanian, A.; Torelli, M.; Ehimiaghe, E.; Walter, S.; Fu, L.; Anderton, C.; Zhu, Z.; Wang, H.; Orr, G.; Murphy, C.; Hamers, R.; Pedersen, J.; Geiger, F. Direct Probes of 4 nm Diameter Gold Nanoparticles Interacting with Supported Lipid Bilayers. J. Phys. Chem. C, 2015, 119 (1), pp 534–546.